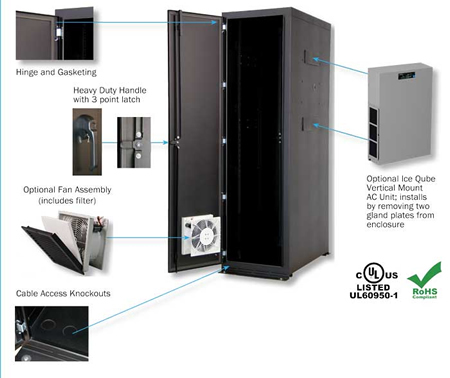 Great Lakes 45U, 24"W, 42"D NEMA12 Server Enclosure - AC unit side panel "A"
The Great Lakes GL840N12-2442-SA is a 45U NEMA Type 12 Server Rack Enclosure. Great Lakes' NEMA 12 Free Standing Enclosures are constructed to be compliant with the National Electrical Manufacturers Association's Type 12 standard. NEMA 12 enclosures are intended for indoor use to provide a degree of protection to the equipment inside the enclosure against dust, falling dirt, water and noncorrosive liquids. These enclosures are also intended to provide a degree of protection to personnel against access to hazardous parts which may be mounted within the enclosure. 2500 BTU, 7.3 amp Ice Qube AC unit with 120V power input. 3500 BTU, 8.2 amp Ice Qube AC unit with 120V power input. 4500 BTU, 9.5 amp Ice Qube AC unit with 120V power input. 6000 BTU, 10.9 amp Ice Qube AC unit with 120V power input.